Salt is always a battle in my household. My husband and two boys could literally eat it straight from the shaker while I would be fine never salting anything. I know your thinking how can a self proclaimed foodie and food blogger hate salt. I seem to be a little bit of the odd one out. Chefs and foodies love salt. It adds flavor and substance to dishes and many chefs claim that over salting if always better than under salting. I salt all my recipes. I just don't add more than is necessary. Salt is absolutely essential for dishes to taste correctly, but I also believe that most Americans overuse salt, sometimes to an extreme. There is a happy medium where the flavor of dishes come through while keeping my blood pressure nice and low. It's also all about moderation as it should be with all food. If I make a dish high in salt one day I try to compensate and make something low in sodium the next. That way everyone is happy and we will all still live until we're at least 90. 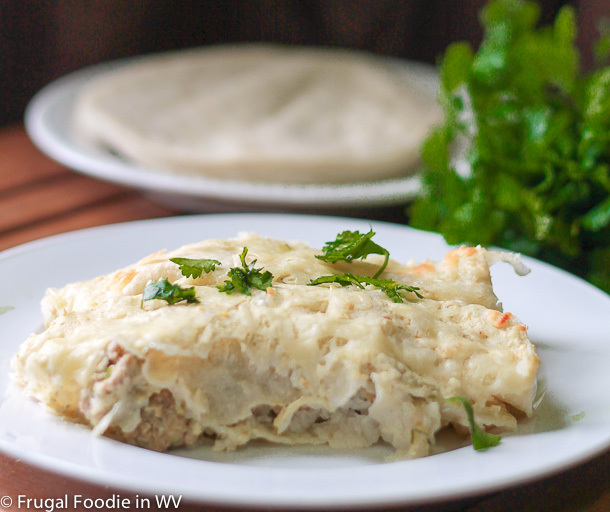 This week I tried a new recipe for Enchiladas Suizas from the April 2013 issue of Family Circle magazine. This recipe has 12 ingredients. It takes 60 minutes of total time, 40 minutes of which is active and makes 6 servings. I did make a few changes to the original recipe. First for the turkey I used 93 percent lean, I substituted non-fat half and half for regular and mild salsa instead of medium since my kids would be eating it. Instead of heating each tortilla individually on the stove, I heated them in two sets in the microwave in between a moist set of paper towels for 40 seconds. I also skipped the step of heating the salsa mixture before adding the cheese, I was in a rush and needed dinner of the table as quickly as possible. Finally make sure to squeeze out the water from the zucchini. The recipe doesn't state this step and it is essential. Place the grated zucchini between paper towels and squeeze. A large amount of water will come out. Without this step the turkey will never brown and your enchiladas will be soggy. I really like how easy this recipe is to prepare. The spices used in the turkey mixture were delicious and my whole family really liked the filling. I do think that there wasn't enough sauce to fully coat all the enchiladas. I would recommend making a double batch of sauce (you won't need it all you can freeze the extra). If you are a big cheese lover I would also suggest adding slightly more cheese to the top. The magazine picture shows more cheese than would actually be there if you only used 3/4 of a cup like the recipe suggests. For the recipe go to Enchiladas Suizas (registration required). Wow! What a delicious blog! I wish I could cook for pleasure, not because I have to:-). Welcome to my blog. Hope we could follow each other. Thanks for the sweet comments :) Followed you back! Thanks :) It was easy too! Oh my goodness I'm starving now! I want to try this. YUM! I love substituting ground turkey for ground beef! Me too, it's a great way to cut the fat! Oooh yum! Way to surprise me again! Never would have thought zucchini! That looks delicious! I sub ground turkey for beef all the time. I recently blogged about a stuffed peppers recipe I modified in a few ways, including using ground turkey in the filling instead of beef. I'm the same way with sodium, by the way; I don't want to be too paranoid about it, but my own health history and some family history dictates caution with salt. I find a little can go a long way when you use good ingredients. I love stuffed peppers, they are delicious! I agree that with quality ingredients you can use less salt! This recipe sounds really easy. Would love to substitute turkey with chicken. I already followed you :) Come back again soon! Thanks for the visit, come back again soon! Thanks for stopping by my blog,Shelly's Bits and Pieces! This looks so yummy! I know my family would love it! Thanks :) It really is yummy and easy! You're so sweet :) We eat a lot of turkey also. It's great for breakfast as turkey sausage. I use sea salt too, I'm not a fan of table salt. The flavor is stronger due to the size of the salt being larger. I hope you like the recipe! Thanks for posting this...I made this two weeks ago and the guys in my house absolutely LOVED it and I couldn't find the recipe!